Bergsig Eco Estate is in a malaria free area 50km's from the town of Bela Bela (Warmbaths), in the Limpopo Province of South Africa. A 2 hour drive from the busy Johannesburg hub places you right at the heart of nature. The serene bushveld with its magnificent fauna and flora creates a beautiful setting next to the splendour of the Hoek Mountains. 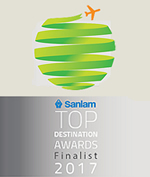 The classic unspoiled mixed bushveld atmosphere has been preserved and plays perfect host to the comfortable luxury accommodation with a bush theme. Bergsig covers 340 hectares of bushveld and the lodge is located on a high lying area close to the Vingerspruit dam, with a panoramic view of the Hoek Mountains and the sweeping valleys below. 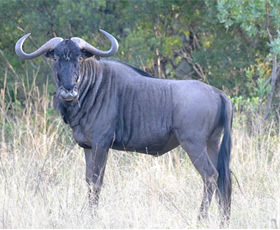 Magnificent bird life, and a wide selection of reptiles and insects create a lively atmosphere for grazing Zebra, Kudu, Waterbuck, Wildebeest, Red hartebeest, Giraffe and many more. Relaxation is what we aim to deliver, whether it is in the sun next to the pool or gazing out over the vast bushveld surroundings, the unforgettable memories will remain with you long after you've returned home. Between the bushes, or sometimes even right at your doorstep, groups of animals can be found grazing peacefully in the surrounding area. When you visit, be sure to bring your binoculars and camera as you get to share the estate with its most esteemed members ... the animals. The staff at Bergsig Eco Estate are a dedicated hard working team of individuals that will make you feel at home and comfortable during your stay here with us. Each group has their area of expertise encouraging a high level of hospitality and helpfulness. Bergsig Eco Estate started out as a game farm and was acquired in August 2001. The present owners started upgrading the facilities and by 2002 the first new lodge building was opened and the property development was initiated. Over the years additional accommodation units have been added, the conference centre built and facilities expanded. 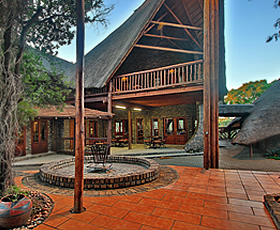 Bergsig's potential as a getaway for the weary executive was noted as the lodge owner also operates a business in the busy hub of Johannesburg and Pretoria. More interesting than our past is our future and the plans we have to further develop and expand this remarkable place we call home. The sectional title was registered on 20 May 2009 and the future is dedicated to the development of an affordable investment for the executive, both financially and psychologically. 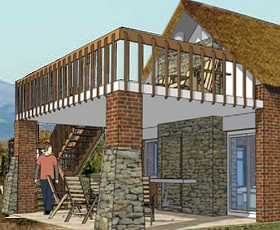 Bergsig development is such that individuals or groups can invest in either multiple bush chalets with a shared entertainment lapa, or for the individual needing a getaway, an investment with payback of at least the outstanding bond if any. "My family members really enjoyed the weekend and the superb accommodation that Bergsig offers. 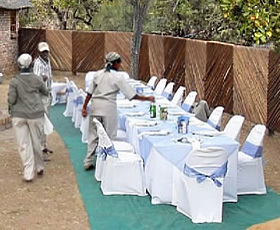 They all expressed their complete satisfaction with the venue and the facilities offered. We will definitely be coming back."